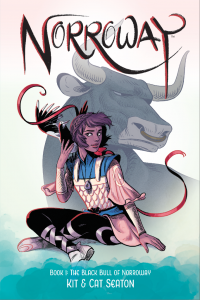 Kit and Cat Seaton are sibling storytellers collaborating on the graphic novel series The Black Bull of Norroway. Based on a classic fairy tale, The Black Bull of Norroway is the story of Sibylla, whose life is forever changed by a forest witch who tells her that she will become the bride the Black Bull of Norroway. As things unfold, Sibylla comes to terms with a fate she’s not sure that she wants. Kit Seaton is an artist living in California, where she teaches as California State University-Fullerton. She has an M.F.A. from the University of Hartford and has been illustrating and publishing comics online since 2011, including The , Otto the Odd and the Dragon King, Eve of All Saints, and AFAR. Cat Seaton is a playwright and storyteller currently living in Morocco. She has a B.A. in English & writing from Southern Oregon University. Cat writes the script, and Kit transforms them into sequential art. Ed Battistella: Congratulations on the Norroway series and on Book 1: The Black Bull of Norroway. It’s a great work, artistically and literarily. How did this project get started? Kit and Cat Seaton: Really, this project has been in the works since we were kids. We’ve always had a dream of working together, and telling stories together, and so if you want to get back to where it started, that’s it. This particular project came out of a class assignment for Kit. She had asked me to write a script for a children’s book mockup, originally she wanted to do East of the Sun and West of the Moon, but we saw it had been adapted several times already. This was back in the winter of 2013. I had taken a storytelling class the previous spring, and encountered The Black Bull of Norroway. It was a similar tale, but one that had not seen the same level of popularity. At first I suggested that script, but quickly realized it would be far longer than the 40 page book Kit was aiming for. We decided to go the route of the webcomic instead, and launched in October of 2014. Ed Battistella: Sibylla is adventurous, tough and snarky, but also capable of being surprised. What sort of comic heroes or fantasy heroes influenced the two of you growing up? Kit and Cat Seaton: A lot of our primary influences came from the media we consumed from the late 90s to the early 2000s. We’re going to give titles instead of particular characters in most instances, because it was the works as a whole that influenced us and left a lasting impression. So, to start with the things we have in common, because usually whatever Kit watched, I had to watch too: Constantine, particularly Tilda Swinton’s Gabriel, The Labyrinth, The Dark Crystal, The Last Unicorn, The Neverending Story, The Lord of the Rings, The Abhorsen Trilogy by Garth Nix (Sabriel was our babe), A Wrinkle in Time, The Thief of Always, Sailor Moon, Inuyasha, Cowboy Bebop, X/1999, Trigun, FLCL, Neil Gaiman’s work (Sandman, Coraline), the list goes on. Kit felt particularly influenced by Jeff Smith’s BONE and by the work of Satoshi Kon (Paprika and Paranoia Agent in particular). For me, Harry Potter of course, and the Gemma Doyle trilogy by Libba Bray. Things that were a little dark, that had a little magic, that had complex and interesting characters who often had flaws they couldn’t overcome. Ed Battistella: I’m always fascinated by the process of visual story-telling and I know that writer-artist teams work in various ways—some from a synopsis where the artists tell the story and the writer adds words later, some where a writer blocks out the story in detail, some where there are sketches and back and forth. What’s your process like? Kit and Cat Seaton: We spend a lot of time on the phone. Literally hours on the phone. We talk about our characters and their personalities, their strengths and weaknesses, their wants and needs. We talk about the plot and where it needs to go, and what difficulties we’re facing, or what areas might be problematic. We talk about everything. After that, I write the script—my main jam is playwriting, so they look a lot like play scripts—and send them on to Kit. Kit begins to break down the scenes into pages, usually 5-7 panels per page. First she figures out how much dialogue can fit comfortably, combined with the action, while leaving a good hook at the end of each page. Then she does maybe grids or layouts, planning out several pages in advance, and really looking at her beats. These are tiny thumbnails, just to begin to visualize things. I pretty much give Kit the script, and trust her to do what she’s going to do. I trust her implicitly. We both know where our main talents are, and we both trust the other person to carry their weight in their respective areas. We’re in constant communication the whole time, so it’s really like we’re working side by side, despite how far apart we might actually be. Ed Battistella: Any major story telling disagreements or are you consistently of one mind? Kit and Cat Seaton: Because of the process, if there’s a sticking point, we talk it out. Usually I’ll notice something isn’t quite working, and I’ll bring it to Kit in the first place. Because we’ve done so much talking and brainstorming beforehand, we know what direction the story needs to take even before we begin to get it down on paper. Ed Battistella: A question for Kit: who are some of your artistic influences? Kit and Cat Seaton: If I’m looking back, of course what was mentioned in our previous answers. Other influences include Arthur Rackham, Harry Clarke, Edward Gorey, Bill Waterson… I think I’ve gotten to the point where my work looks like my own work, but that’s it adopted a lot from a lot of other people’s work. Ed Battistella: What’s planned for future volumes? Kit and Cat Seaton: The next two books will complete the fairy tale, as well as take it on a dark and twisty turny road, where we really get to see Sibylla come into her own. Understandably, we can’t talk about that content too much. Ed Battistella: A question for Cat (and Kit): what did you read fantasy and fairy tale wise that influenced the series? The Scottish tale of the Black Bull of Norroway of course, but what else? Kit and Cat Seaton: Oh boy. So again, that giant list above. But also, the Time Life books, Andrew Lang’s books, Yeats, just all the fairy tales in general we’ve consumed over time. Grimm’s, of course, the HBO series Jim Hensen did… The Storyteller, it was called. We both loved fairy tales and folk tales as children, so we actively sought them out. Ed Battistella: Your publisher is Image Comics. How did that relationship come about? Kit and Cat Seaton: That came about through an established relationship Kit had with them, from her work with Leila del Duca on AFAR. Ed Battistella: Tell us about the video content and about the marketing campaign. Kit and Cat Seaton: We don’t know much about the video thing yet, but for marketing we’re working in tandem with Image comics. We’re sort of playing it by ear, but they seem to have a pretty solid plan. Ed Battistella: How can readers get the Norroway series? Kit and Cat Seaton: Readers can pre-order from local bookstores and comic shops, they can request their libraries to carry it, they can also pre-order online from Amazon, Barnes & Noble, and other large retailers. We highly recommend supporting local businesses and libraries! Ed Battistella: Thanks for talking with us. Kit and Cat Seaton: Thank you!